The JamCube is lightweight, full-featured, and with its adjustable shoulder strap, super easy to transport. The system is built around a four-channel mixer that can accommodate both microphones & instruments. Its built-in media player will play just about every kind of disc out there, including CD, MP3, DVD, CDG, and Photo-CD. If you prefer to tote your media on a portable storage device, the onboard USB port and SD card slot can access your files. 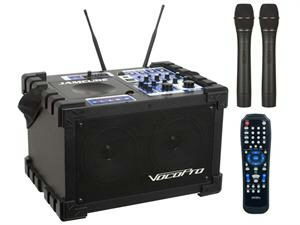 * : Please call us for any questions on our karaoke machine rentals in Butler PA & Western Pennsylvania.